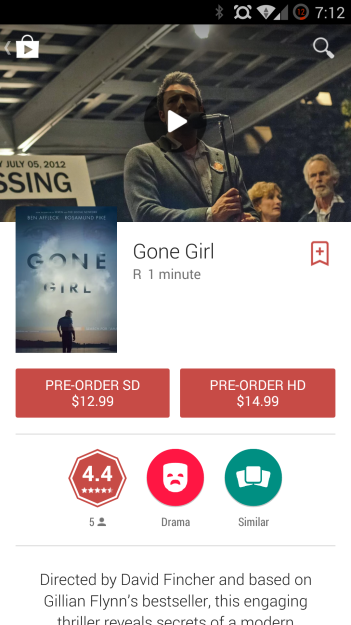 The latest version of the Google Play Movies app has been rolling out to users over the course of the past week, and while we found in the code that the changes had something to do with placing pre-orders, we had to wait for Google to flip a switch somewhere for the functionality to get exposed. Now that Google has taken to its social network with the news, consider that switch flipped. 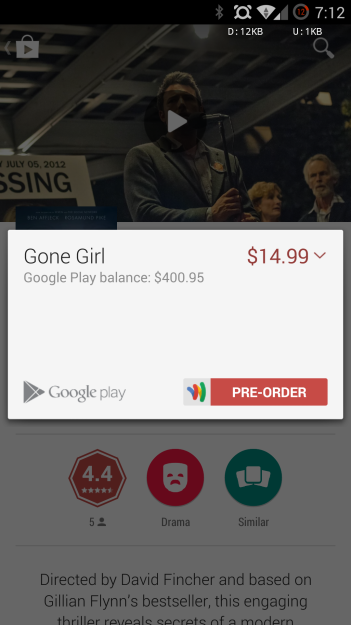 Play Movies 3.3 is ready to let you pre-order upcoming releases so that they're added to your library and available for streaming the moment they come out. These pre-orders are for purchases only, so prices range from $12.99 to $14.99 depending on whether you want to watch the video in SD or HD. The option to pre-order a rental isn't a thing, so you will need to wait until the film officially comes out to check it out for a couple of bucks. As long as you remember to check back on launch day, it doesn't make much of a difference one way or the other. People who pre-order aren't getting earlier access to content than anyone else. Since these are digital copies, there are more than enough to go around. The update has been out for a while, but if it has yet to hit your device, you've come to the right place. For now this feature is available exclusively in the US, but more countries are on the way.